I love it because it is super portable, sets up in less than 3 minutes, and doesn't take up much room to store. For the frame, I got two 96" wood strips sawed in half to make 4 48" pieces. Drilled a 3/4" hole a few inches down from the top to slide a long dowel into to make the frame (just like in this tutorial from Cakies). I also drilled a hole about an inch from the bottom of each board to slip ties into to hold the cover. To make the cover, I used two twin size flat sheets from Walmart ($5 each for about 3 yard of fabric....and the side hems are already done for you!) and sewed strips together to make stripes. 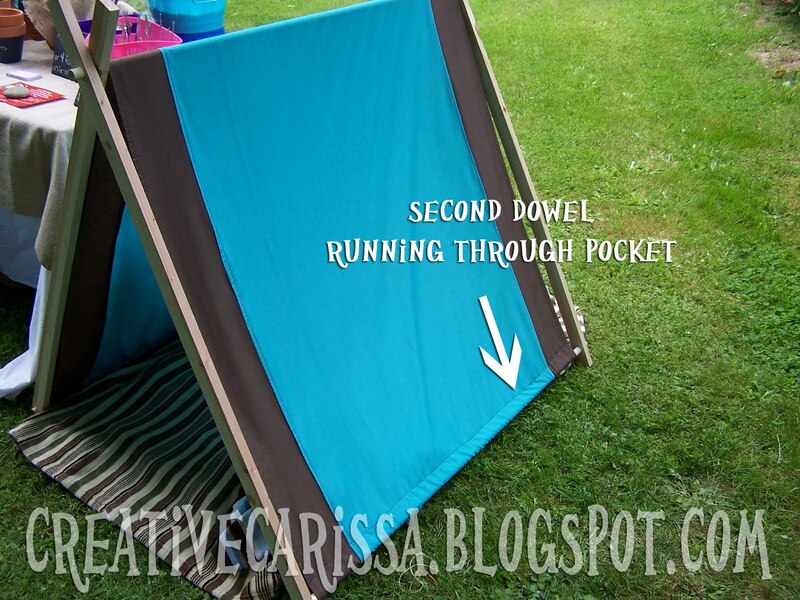 The size is perfect and 2 sheets gives you enough fabric for 2.5 tents. 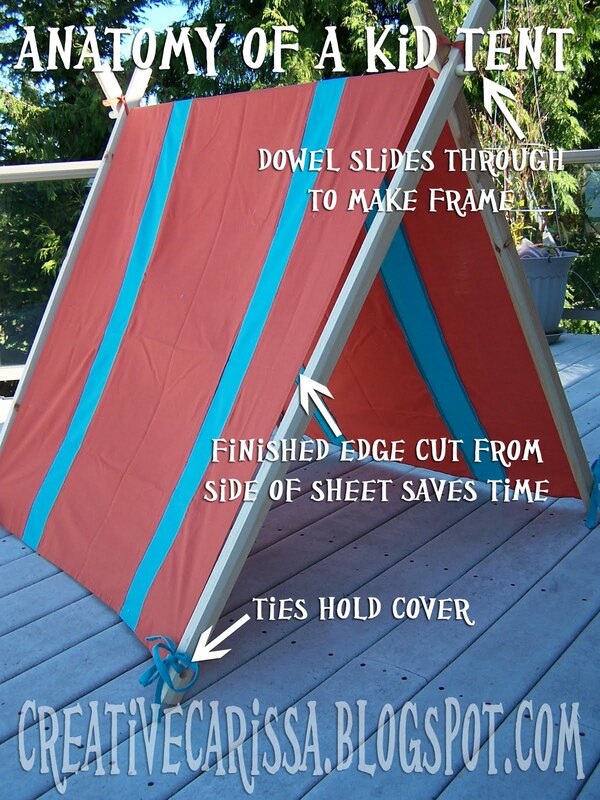 So if you mix and match your sheets and then throw in some scraps from your stash, you could make a tent for your kiddo and a couple more for birthday presents. ...and had two more dowels running through the bottom set of holes and through a pocket along the lower tent edge. This design was great the day I made it. The two extra dowels along the bottom gave the tent awesome stability. 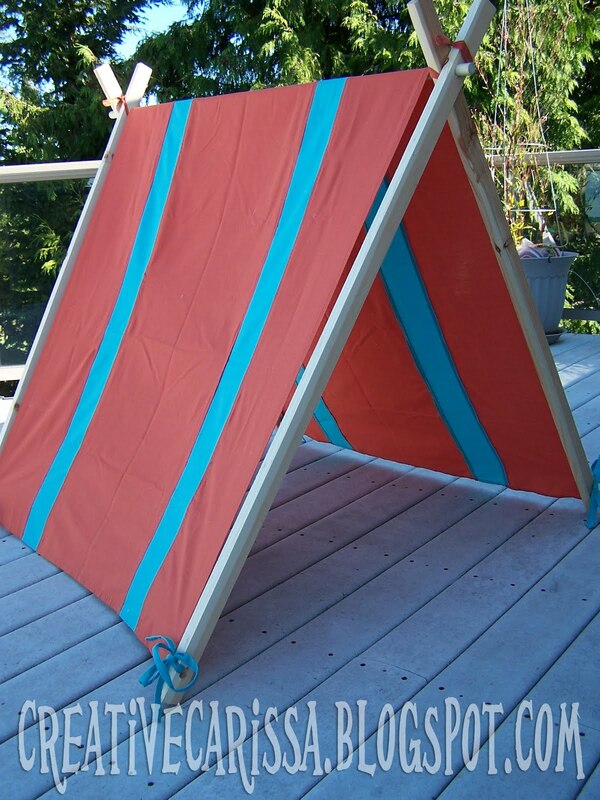 But then after storing the wood in my garage for a few weeks, the boards warped juuuust a little: just enough that everything didn't line exactly right and it made the tent stand wonky. So I had to take out the bottom dowel support and go with the tie method instead. 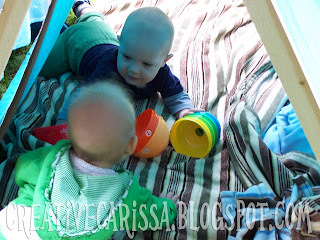 Either way, though, tent definitely seems to be kid approved! 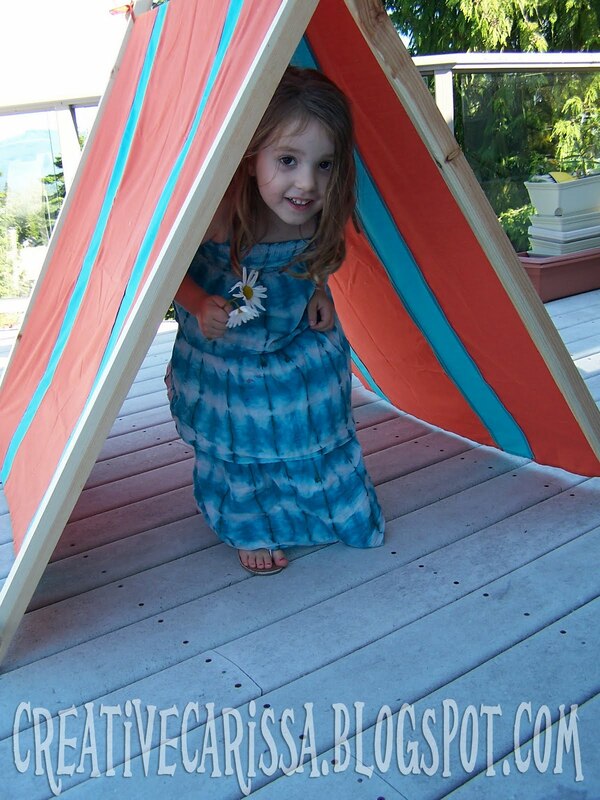 What little kid wouldn't want their very own tent to crawl through and play in? The DIY Play tent from Cakies uses elastic to hold the cover on and the frame is very similar to the way I did mine. The Easy Kid Tent / Reading Nook from Ana White homemaker bolts together and is better for setting up somewhere that it will be staying for a while. Or for a different design, Smile and Wave has a tee pee style tutorial that looks super cute. And I can hardly believe that Jen from Tatertots and Jello picked me as her fave project for sewing week!! Please come check out the other awesome projects and winners of the sewing challenge at the CSI Project here.